The Run Inspire Pullover was featured in this ESPN Article. Looks like they must have got a sample product to try out ahead of time before they were released to the general public. 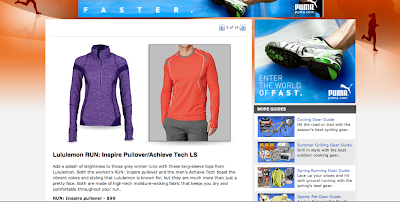 Rant: The “strategic” release of the Inspire pullover is really irking me. Not just the US before Canada issue but the fact that it’s been released in San Diego and Santa Barbara prior to some colder climated US cities is just weird. I fully expected that given the popularity and hype of this items (I take only partial blame for the hype) that it would be an online first release as they sometimes do. that way, all of us lululemon fanatics that are in the know have an equal opportunity to purchase instead of just waiting around, or in my case running around, shivering in inappropriate fall running gear. Boo!!! If I had this item right now it would be used now and not in a few months which means instead of just sitting in my closet waiting for colder weather it would be out in the world promoting itself. Yeah, I agree. I don't live near a store so I'm really going crazy. I'm not getting my hopes up any longer that I will ever get my hands on one of these!! I think lulu's only strategy is to make money unfortunately. One of their featured tanks in a Health magazine about 5 years ago is what clued me in to lululemon long before any stores existed near me! I will agree, it's annoying that it's so highly publicized for so long before you can get it. I found that site when googling [Lululemon "inspire pullover"] hoping to come across more sneak preview pictures either on fb or store sites. Was surprised to see it on ESPN. my store got them in today (troy, mi – somerset)…driving down there in a bit to pick one (or two) up 🙂 they will be posting pics on their fb page soon! they said they got purple, pink and the grey stripe. but does that really make them more money? I think there is a sweat spot with the hype and beyond that you start to alienate your customers. RunningOnCoffee we had a rainy/cold weekend here last week and I was cheering only because I got to wear all of my Lulu fall goodies. it's an odd combination now of warm sunshine with a slight crisp in the air so I've been wearing my long sleeve swiftly a lot but I think in a matter of a week it will be cool enough to require the pullover.